Did Gene Kelly Have Children? Did Gene Kelly Have Any Children? 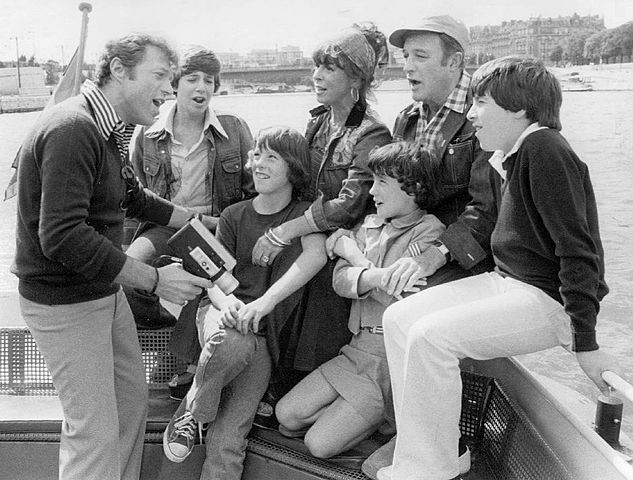 Steve Lawrence, Eydie Gorme and their two sons with Gene Kelly and his son, Timothy, and daughter Bridget, 1971. Credit: Wikimedia Commons. Gene Kelly had three children. ​His first was a daughter, KERRY, born in October of 1942 to Gene and his first wife, Betsy Blair. And with all of this Gene is great fun, too. He and Kerry sing together all the time. At five, Kerry knows the words of at least a dozen songs she's learned from Gene. And sings them like Gene. And looks just like him, Gene's eyes, his mouth, his mannerisms, and light as spindrift on her feet. I think Kerry is one of the luckiest little girls in the world. In this Person to Person interview with Edward R. Murrow (1958), Gene shows off a picture that Kerry, at age nine, drew for him (about 3 min in). For more on Kerry's take on her father and his career, listen to her interview with Stephen Bogart (Humphrey's son) on Icons Radio Hour and/or check out PBS's American Masters special, Gene Kelly: Anatomy of a Dancer. Tim went to the University of Southern California's Film School and perhaps still works in the film industry. I was in the Cedars of Lebanon hospital waiting for Jeannie to give birth, when I received a phone call from a well-known newspaper columnist who congratulated me on becoming a father again and what, he wanted to know, did I have to say for myself? Well, I had no idea Jeannie had already delivered, and wondered how the hell the guy had heard before me! I knew it was impossible to keep a secret in Hollywood, but this, I thought, was ridiculous! Bridget attended college in Paris and lives with her family in Montana. Boger, Frederica. "My Kids, the Kellys." Photoplay. Feb. 1949. Hirschhorn, Clive. Gene Kelly. New York: St. Martin’s Press, 1974.